The Speaker of the Lagos State House of Assembly, Rt. Hon. Mudashiru Obasa has said that if Nigeria’s education would be standardised, training and remunerations of teachers must be prioritised. Obasa was speaking as the Chairman of the 55th Birthday Lecture and Award Giving Ceremony of the Chairman, House Ad hoc Committee on Education, Hon. Olanrewaju Ogunyemi. Obasa said: “Education need teachers and the teachers have to be treated as special people to get result. “The training and pay must be satisfactory. This was what we realised when went to Finland to see how we could borrow a leave from them as they have the best education system in the world. The speaker stressed that education funding should not be limited to the government alone, and that empowerment of teachers remained the way to go in improving the quality of education in the country. He said that education should be the business of the local government and the state government. “It is when we empower the local government that is the closest to the people that we can get the participation of the people and move forward,” Obasa said. The Speaker equally said that for the development of the nation’s education, Nigerian school children must learn to speak their mother tongues. According to him, there is need to look inward and ensure that teaching and learning are carried out in the children’s mother tongue in the early part of their education. “If we lose our language we have lost our culture. We should allow our children to learn in their mother tongues until certain years, when they will start learning foreign languages,” he said. He emphasised that in Finland, which has the best educational system in the world, children begin to learn foreign language from age nine to 13 saying teaching and learning in the early years is in Mother Tongue. 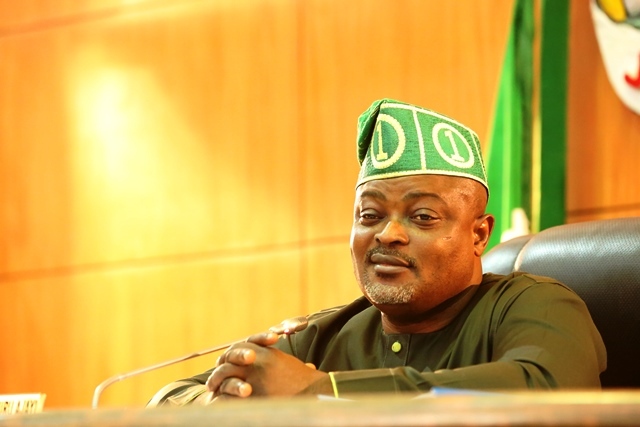 Appraising the celebrant, Obasa stated that he was an asset to the Assembly, adding that he is a trustworthy lawmaker that has done his best to promote the education sector. He added: “The celebrant means a lot to the House for his loyalty, support and dedication to the education sector and legislative business. “Hon. Ogunyemi is special to us and he has done so well; he is one of the reasons the Lagos Assembly is above the common standard of excellence. “Ogunyemi is very loyal and respectful. He is loyal to me as a speaker, he is supportive and dedicated to the party as well as to the legislative business. “He has been saddled with so many responsibilities and he has never failed. He is one legislator you would give assignment and you can go to sleep”. In his Keynote, Governor Rauf Aregbesola of Osun State said that funding remained the hydra headed monster hampering the development of education in Nigeria. The governor, who was represented by Dr Adeleke Ipaye, the said in his lecture on the same topic that the celebrant had been able to contribute to the development of education in the state. “Olanrewaju Ogunyemi has done a lot as the Chairman of the House Committee on Education to find solution to a major problem in the sector, which is funding. “We must device a means through advocacy to ensure that countries that benefitted from brain drain contribute to the development of education in our country,” Aregbesola said. He said that no price is too much for parents to give their children education to eliminate criminality in the country. The governor urged parents to only have the number of children they could cater for. In his remarks, Ogunyemi said that quality education comes at a cost and that nothing should be too much to educate Nigerian children to guarantee a better future for the nation. “Education enhances the future of a nation. We should encourage our teachers, we should pay our teachers very well. Teachers are the kings, and quality education must go round. 40 students selected from primary, secondary and tertiary institutions benefited from Ogunyemi Scholarship Award Scheme to the tune of N2.8 million. Miss Ariyo Toluwalase, one of the beneficiaries of the scholarship award commended Ogunyemi for investing in the future of the students.